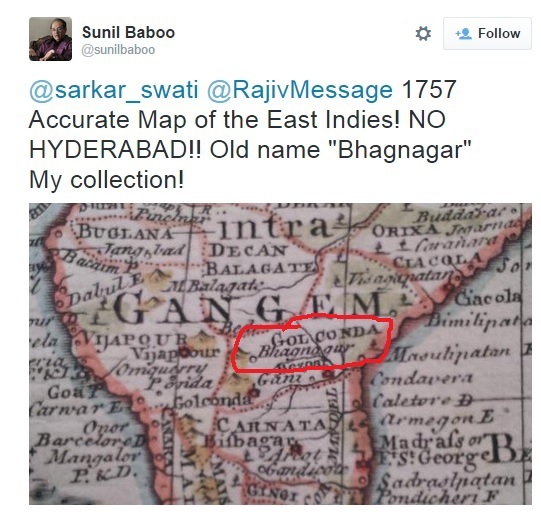 A tweet by Sri Sunil Baboo shows that even in 1757 Maps, Bhagyanagar was not known as Hyderabad. It is therefore clear that the state was called Golkonda and Bhagnagar was a city there. It is nothing but mischievous propaganda that stated that the city of Hyderabad was known by this name for 400 years. It also makes the case clear that the story of Bhagmati being converted to Hyder Begum and hence the city name was changed from Bhagnagar to Hyderabad is also nothing but propaganda. It is clear that the city was named on the Goddess and it also makes the case for a bhavya Bhagyalakshmi temple very strong. This entry was posted in History, Threats and tagged Bhagyalakshmi Temple, History of Bhagyanagar, History of Hyderabad on July 22, 2015 by arisebharat. upload this original & full map those you have…. and every places is not correct in your map you have to see with your own eyes.. karnataka is available on left side behind of telangana state but in this your worst map is showing bhagyanagr is bottom location of telangana….